We love teriyaki sauce at our house and find that it’s great in stir-fry, on fish like sea bass and salmon, and on meat like chicken or pork tenderloin. This particular teriyaki sauce was inspired by a sea bass recipe my mother-n-law emailed to my husband back in 1998…and I still have a copy of it! We were both in college at the time so looking back I am impressed we were even contemplating homemade teriyaki, but I have to say I am equally impressed that I still have the print out (and that it was easy to locate) in my recipe collection. I personally think a long-running collection of favorite recipes is just invaluable. What old recipes have you been holding onto for years? Mix together all marinade ingredients from the soy sauce down to the garlic (including the water if using to help cover the meat). 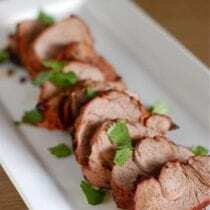 Pour marinade over the pork tenderloin in a fairly small container so the liquid covers the meat. Let it marinate in the fridge for 30 - 60 minutes (the longer the better although if you are really short on time 20 minutes will do the trick). If the marinade doesn’t fully cover the meat then flip the pork halfway through the marinating process. Heat up the grill to a medium-high temperature (we like to spray a little cooking oil first to prevent sticking). 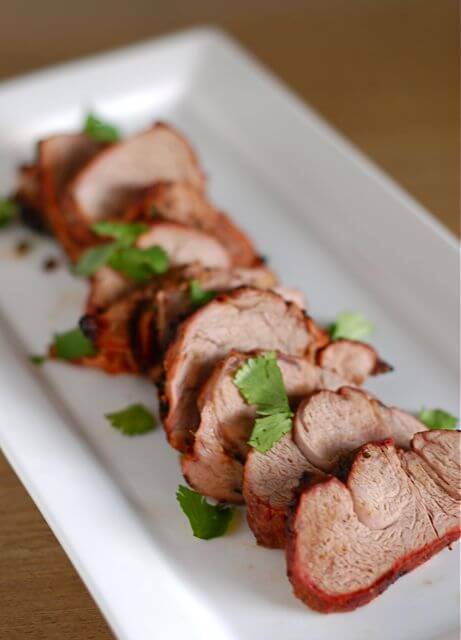 Grill the pork for about 10 – 15 minutes on each side or until the internal temperature reaches 150 degrees F.
Slice and serve warm with other Asian inspired dishes…enjoy! Can’t wait to try this marinade. 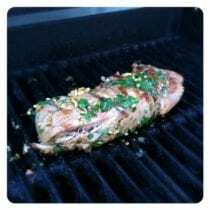 We always grill pork tenderloin using the 7-6-5 method. Grill on high 7 min, flip and grill for 6 min, turn off gas and leave on covered grill for 5 min. Always comes out perfect and doesn’t dry out. Sounds like a good cooking method…thanks for sharing! You can always buy your tenderloin from a local farmer that raises them cruelty free. Sharon – I am just curious if you actually read the recipe I posted above? Specifically the part where I said “1-1.5 lbs pork tenderloin, organic and/or local recommended”?? Our pork in the picture came from a local farm called Grateful Growers (http://www.ggfarm.com/), which is far from a “factory farm cruelty farm” as you called it. Grateful growers is awesome, been out to the farm in lincoln county a few times and those pigs are treated like royalty. They’ll even bring whatever you want to any of the local farmers markets around Charlotte as well. does the cilantro make or break the sauce? any substitutes you’ve tried for it? I’m figuring out my husband isn’t a big cilantro fan. It wouldn’t be the same without cilantro, but I think it would still be good. My husband talked me into buying a pork tenderloin today and I had no idea what to do with it. Great timing. Our meat guy said to cook it to 140-145F and even gave us a nifty one time use thermometer. We already have one, but it’s still pretty cool. Lovely! I’ve also made a nice tangy teriyaki sauce from reduced balsamic vinegar and soy sauce. Woo hoo! Huge fan of the post and this website… can’t wait to make it! I just recently discovered your website and I am on it daily (making your banana pancakes right after I finish typing). Thanks a million! Also just wanted to spread the word on a soy sauce alternative as I haven’t seen it used/posted on your site. “Bragg Liquid Aminos”, a Vegetable protein seasoning… it’s a natural soy sauce alternative with no preservatives. Certified non-GMO. Just fyi if you haven’t heard about it yet. We use San-J brand (purchased from Earth Fare). Be sure to check the ingredients of all the options because there should be some better than that! I made this for dinner tonight…YUM! Thank you for all of the wonderful recipes! This was so delicious! Served it with brown rice and stir fried veggies. We will definitely make this again! I just made my own Teriyaki sauce last week for a recipe too and I didn’t realize it was going to be so easy. I really wanted Teriyaki but didn’t want to buy the sauce because of all the crap in it. I’d love to try this out next time I have a pork loin – thanks for sharing! This was one delicious pork tenderloin. My whole family loved it, even my son (toddler) who is a picky eater. Thanks so much. This is a keeper. We made this last night and all of us devoured it! This recipe definitely makes it into the permanent rotation. Thank you. I made this this weekend and doubled the marinade … used it on chicken and a pork tenderloin. Both were DELISH! Thanks for a new keeper! I would love to try this recipe but we are not allowed to have a grill at our condo! Is there a way that this would work for the oven or crockpot? Hi Sherry. I don’t see why you couldn’t do it in the oven. I would try it on 350. You can look up the cooking time based on how many pounds of meat you have. Good luck. I just made this for the first time tonight – absolutely delicious!! We don’t have access to a grill, so I put some coconut oil in a skillet to brown the tenderloin and then put it in the oven at 425 for 15 minutes – it came out great!! Thank you for sharing your wonderful recipes!! Feel like we have found a new way of living. Regret we waited until our 60’s to become enlightened! But our grown children and grandchildren are benefiting from our quest. Regarding this recipe, suppose I could use pork chops and either simmer covered on the stovetop, slow cook in crockpot, or bake in the oven? Don’t happen to have a tenderloin on hand for dinner tonight. Thank you for marvelous resource that I have passed on to many of my friends. One group of much younger mothers are meeting one night a week to compare notes and share ideas. It started with your websight and blog! You must be so proud of all the lives you have touched in such a positive way. Great recipe!! My wife and I will be cooking this again really soon. We had no leftovers. This recipe was delicious and easy to make! Do you think I could use red wine vinegar or rice vinegar in place of the white wine vinegar? Can this be made in a slow cooker? Hi, I’ve been struggling to find soy sauce and/or teriyaki sauce that don’t have crappy ingredients. Can you recommend a soy sauce? Hi Tracy. You should be able to find an organic Tamari soy sauce. I like that you used 6 cloves of garlic. I’m always finding myself doubling the garlic in many recipes because it is never enough.